University of Wisconsin-Madison engineers devised a new method that grows graphene nanoribbons directly on a germanium wafer. The ribbons are of excellent quality and the technique is compatible with current manufacturing methods. These sort of ribbons have been heralded by industry experts as the component of the future which will make electronics faster and more efficient. The only thing that’s been missing until now was a sound way to make them. Graphene – the one atom thick carbon allotrope spaced in a hexagonal lattice – is a wonder material with fantastic electrical conductivity and heat dissipation. These properties makes it an ideal component in electronics, but graphene on its own is rather useless for semiconductor applications. For graphene to work as a semiconductor, it needs to be able to switch currents on and off. In more technical terms, previously scientists calculated that an optimal design would be a 10nm wide graphene with a well-defined edge where carbon-carbon bonds are parallel to the edge (the ‘armchair’ edge). These sort of requirements are by no means easy to deliver. So far, two distinct approaches have been used to make the ribbons. One is “top-down” and involves cutting ribbons from a lithographically layered sheet of graphene. However, this method leads to ribbons with rough edges and variable size – a level of imprecision that is unpractical for use in high-grade electronics. The “bottom-up” method involves making the ribbons through chemical means from the ground up. Typically, various molecules react on a substrate surface where they polymerize into the ribbons. The quality of the ribbons is great, but the downside of the “bottom-up” method is that it only works on metal surfaces and the resulting ribbons are too short. The UW-Madison researchers also used a “bottom-up” technique, with some key differences. Using chemical vapor deposition, the researchers carefully sprayed a germanium wafer with methane. 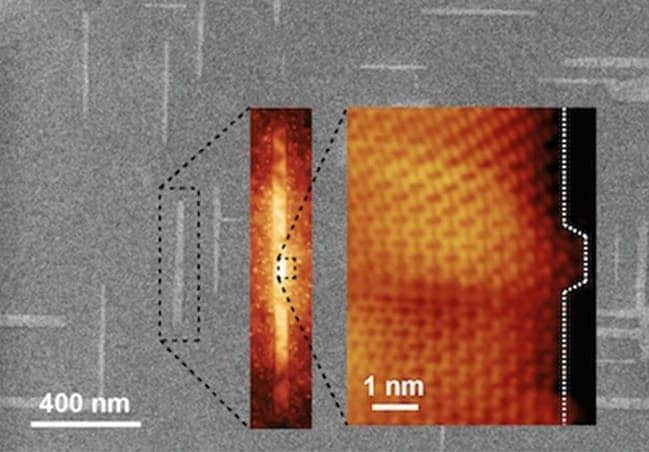 Th methane gets adsorbed by the germanium wafer and eventually decomposes into graphene. Now, they key is to use methane in very small concentration to slow down the growth rate. At a low growth rate, the graphene crystals naturally grow into the ribbons. 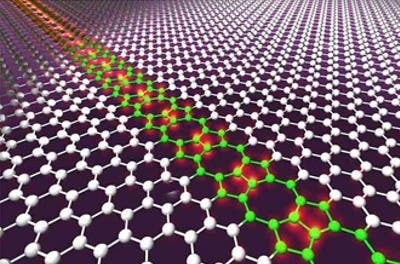 Besides fast electronics, the graphene nanoribbons can also be used to fashion chemical sensors which are very tiny and sensitive (very useful for detecting drugs or explosives). For the moment, Arnold and colleagues are concentrating on refining their method. For instance, they’ve yet to find a way to control the growth of the ribbons, i.e. choose where the ribbons start growing and in what direction. Findings appeared in Nature Communications.